With love and devotion, Asya recollected the times with her Russian husband, who took great care of her and the family. He passed away in 1983, leaving Asya to raise their two children alone. For years, she had been working at the yarn factory in Gyumri, where she’d even received a Best Worker award at one point. “Upon graduating from the textile college, I started working on the factory floor, even though I had the skills to be a master assistant. During Soviet times the worker’s job was more profitable, and I could make enough money to support my kids,” she remarked. Last year, Asya received a free eye examination thanks to a joint effort between Ayo! and the Armenian Eye Care Project (AECP). Then she had surgery for her glaucoma. She is hopeful that she will soon fully recover her vision and be able to read again. She is grateful to FAR’s donors for extending her a helping hand. “Our cook is a master, and those who distribute the food are nice and kind, too. Thank you for everything,” she said. 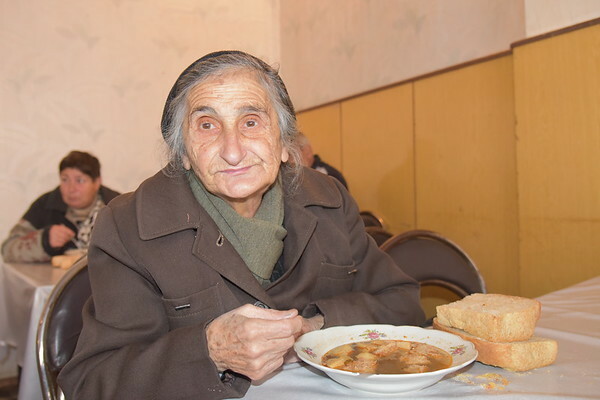 FAR’s Gyumri Atinizyan Senior Center serves meals five days a week to 160 elderly.